Every so often, I see something that makes me geek out a bit… or a lot. Most times, the "geek out" can be cured with a tweet or two, but sometimes 140 characters isn’t nearly enough. Sometimes I need a whole blog post. My first thought was: What if people were as spaced out (relative to our size) as stars are? Finding the average human height turns out to be a bit tricky. Different countries have different average heights. In addition, men and women tend to be different heights. Averaging the two figures (men and women) on this page gives me 66.6 inches. Of course, the rest of my figures are in metric, so let’s convert that. 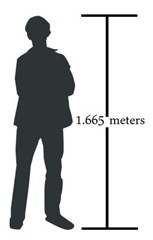 The average person is about 1.665 meters tall. Now, Phil’s tweet indicated that a star’s "elbow room" was 40 million times it’s width (on average). Scaled down to human-sized figures, this would be 66,600 kilometers between each human. 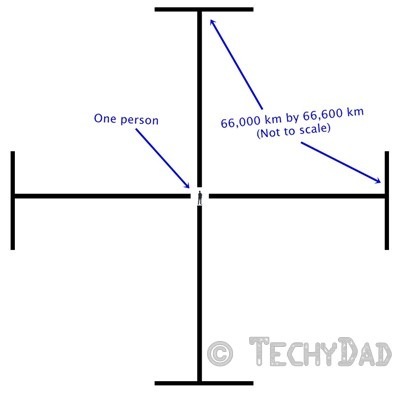 Arrange the people in a grid and they would each have a square foot area of 4,435,560,000 km (66,000 times 66,600) all to themselves. Now, we’ve run into a problem. The Earth has a surface area of about 510 million square kilometers. There simply isn’t enough square footage to separate two people on the entire planet Earth. 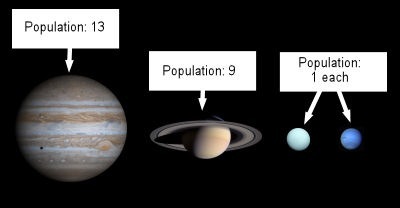 In fact, the only planets whose surface area would be big enough to support two or more humans at "relative star distance" would be Jupiter (13 people) and Saturn (9 people). Uranus and Neptune would be only be able to support 1 person each and the other planets are simply too small. Therefore, counting only planetary size and requiring at least 1 "relative star distance" per person, the solar system’s population would be a whopping 24. Now, obviously, there isn’t a tiny amount of stars in existence. Thanks to the huge Universe (impossibly huge, unimaginably huge), there are a lot of stars in the sky. There are somewhere between 100 and 400 billion stars in our galaxy and possibly as many as 100 billion galaxies. This means that there is somewhere around 10 sextillion stars in the known Universe. (For those keeping count, that’s 10,000,000,000,000,000,000,000 stars.) The biblical pledge to "make your descendants as numerous as the stars in the sky" was really saying something. One hopes that we’ve invented space travel by then, because that would be one crowded Earth. But how crowded? If we magically increased the world population to 10 sextillion right now, how much space would you and I have to live on? To make things simple, we’ll also magically make every square inch of the Earth able to house a human being. Even the oceans and mountains would be fair game. With 10 sextillion people and a surface area of the Earth as specified above, each person would have to occupy an area about half of a square nanometer. To put this in perspective, this is slightly less than the width of a Uranium nucleus. Talk about a tight fit! What about Jupiter, though. Surely, if we all moved to the Solar System’s biggest planet (and could somehow withstand the gravity), we would have room to spread out, right? Sadly, Jupiter "only" has a surface area of about 61,400,000,000 square km. Even a helium atom’s width would be too much. So let’s move to the sun. If we can magically make 10 sextillion people appear, we can also magically keep them from incinerating (or getting crushed by gravity or suffocating from lack of air) as they move onto the Sun’s surface. Even that would be too tiny: Two carbon atoms’ width per person. This "as numerous as the stars in the sky" thing is starting to sound more like a curse than a blessing! Thank you for indulging me in my little geek-out. Hopefully, I was able to translate just how many stars are in the Universe and how spread out they are in space. Disclaimer: The person silhouette image is by rejon on OpenClipArt.org. The images of Jupiter, Saturn, Uranus, and Neptune were obtained from Wikipedia (links to each on each of the planets’ names) but are public domain images taken by NASA. 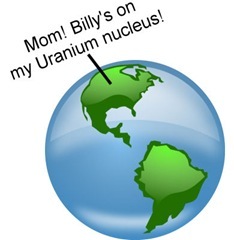 Finally, the "glossy globe" image is by freedo on OpenClipArt.org.